With the power light bleaching, your teeth will be dramatically whiter after only one visit. 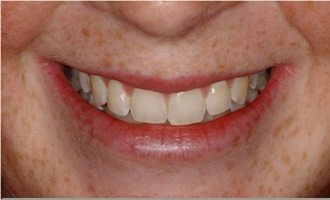 Here are before-and-after photographs of a patient treated by one of our mynewsmile.com network dentists, Dr. Susan Hollar of Arlington, Texas. This is the same patient, one hour later. There is a greater tendency to sensitivity. Some people, after the power bleaching appointment, feel sharp zings in their teeth for a day or two afterward. The zinging is eased by taking two to four ibuprofen immediately at the end of the appointment, before your teeth actually begin to zing. 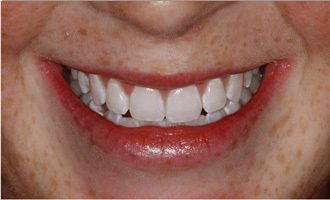 Click here to read about the laser tooth whitening procedure. This information was personally written by Dr. David Hall. 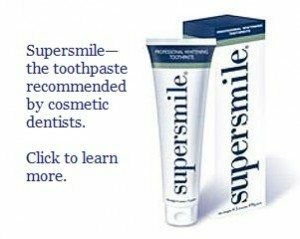 If you would like to be referred to a cosmetic dentist who would be expert in all of these questions about tooth bleaching, please see our cosmetic dentist referral page. Click here to ask Dr. Hall a question.